I did this card for the Festive Friday Challenge whose theme this time is "whimsical". Did you notice anything missing from this card? Yes, sadly there are no birch trees in this one. heheh! I had to move on. These are fir type Christmas trees, which I really like too, so it's good :) I used more of my Paper Smooches stamps. I'm stuck on this Warm Hearts set and can't seem to stop. I have a few more cards to post with it and then like my birch trees, I'll be moving on. Anyway, isn't that fabulous paper I used at the bottom? When I saw it I thought it was sooooo perfect for this card. It already had that cute little scalloped border on it. It's Merry and Bright by Carte Bella. I glued that down, rounded my corners, then adhered the white scalloped piece, which I had already colored with my Copics and paper pieced. I then added the little extras with foam tape. Hope you all have a wonderful Sunday and week! Your fun colours and dp's are perfect for this challenge! Thanks for joining us at Festive Friday! You did make a purely magical card, Kay! And since those Christmas trees are whimsical, why can't we imagine that they are birch trees underneath that pretty patterned paper?! How adorable is this!! Love that you did the tree all festive in pink! 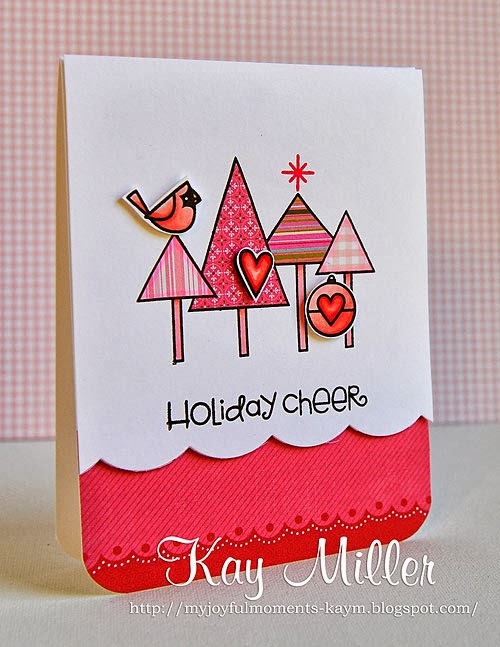 Kay, this is the cutest pink Christmas card I've ever seen! I must admit, I think your entre blog is one of the cutest blogs I've ever seen, too! I just signed on to follow...and spent a few minutes looking at your fun posts, what amazing cards!! This is just so sweet Kay - and totally whimsical! I love that stamp set! Wow, your cards just blow me away! (me ...grinning..thinking "So glad I discovered you!" Have a great day Kay! Oh, yes...you DO have magic!!! These colors look gorgeous together and your images are adorable and sweetly placed! BEAUTIFUL design, Kay!!! Great to have you and this sweet project at Festive Friday!!! Oh Kay, this is magical for sure! You have the touch to create fantastic cards time after time. I'm so glad you are willing to share your creations with us. Love the paper, the placement, the theme. Every little bit fits together perfectly. Awesome! Have a happy day! where have you been all my blogging life? How did I miss you? Suddenly I see you all over pinterest and so i had to come by and subscribe. I don't want to miss a thing!! This is so stinkin' cute! Love pink for Christmas. This is absolutely gorgeous, Kay! You do amazing work and I'm happy to see that you're trying out for the Paper Smooches guest spot! What a fabulous festive and cheery card this is! Saw it on Pinterest and just had to pop by and tell you how cute this is. Yep, this is magical Kay! Oh my gosh I love the pink trees. You have inspired me to do more shopping at PS . You have to get the DT spot you are too good at this! Hope you have a great week too! This is just lovely Kay. Such fun and really cute! Awww, so sweet! Love all the colorful trees and darling little bird! this is amazing! I love the colors! Oh, I LOVE this! 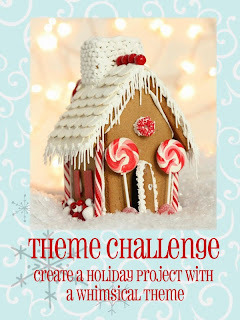 So fun and so well put together - I love the paper pieced trees! Thank you so much for sharing this with us at Festive Friday! Kay ------YAY!!! WINNER, WINNER!!! What a way to start your Friday, huh!!! Never a doubt you would ace this challenge Kay..The second I saw this card it was Pure whimsical magical adoration!!! BYW I am tickled to be a shout out too!!! Happy thoughts!!! --Have a SUPER weekend!!! Congrats, Kay...this card was pretty pink PERFECTION!!! Congrats on your well deserved win - I just love the paper pieced trees and the cute bird!